I know, I know, it’s just a container. But it’s the most perfect personal sized salad container I’ve ever seen. My friend Caz brought to work a salad in it a year ago and within a week all my friends had one. Mine is getting a little worn and after 11 months my fork finally broke so I was thrilled to find it in stock at Target once again. You can find it in the seasonal aisle with summer stuff. It’s cost, a mere $2.99! They also have a really cute “meal” version with the separated sections. I did not purchase that one simply because I don’t heat food in plastic and assume I’d only use it for hot food. 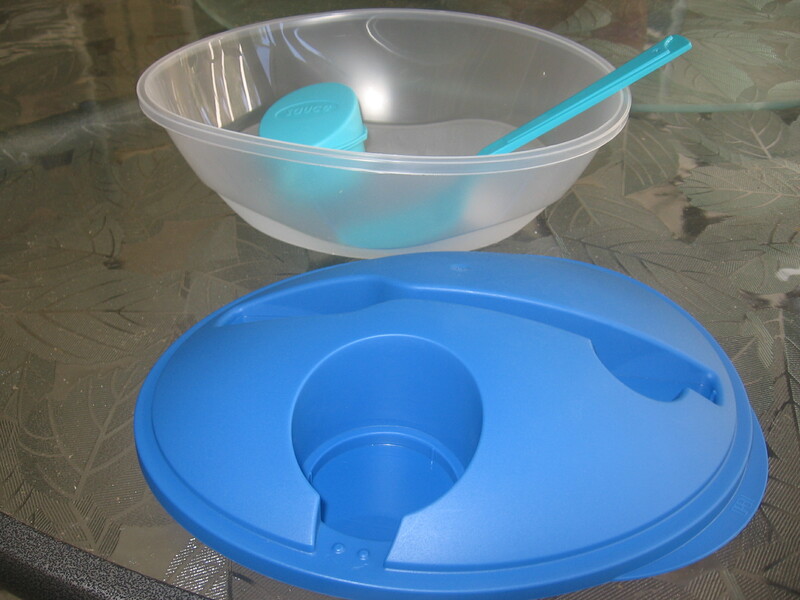 As you can see this is a complete salad kit. The best part is that it does not leak at all! It is a perfect size for a meal sized salad, the fork doesn’t fall out and the cup for dressing actually holds the dressing. I only dress my salads with oil and vinegar so that’s pretty amazing. It’s not too large so it fits perfectly in my lunch bag. 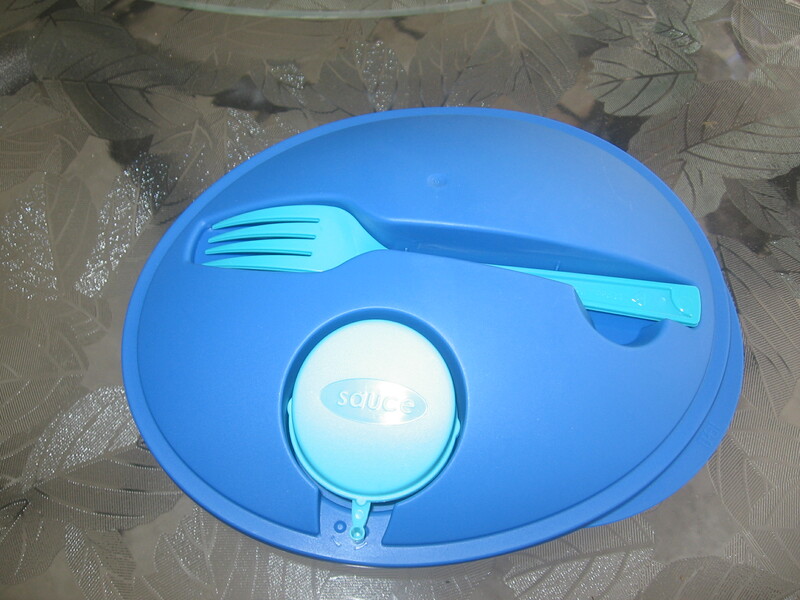 So I have 1 item that is food friendly, functional and environmentally friendly since it’s reusable. 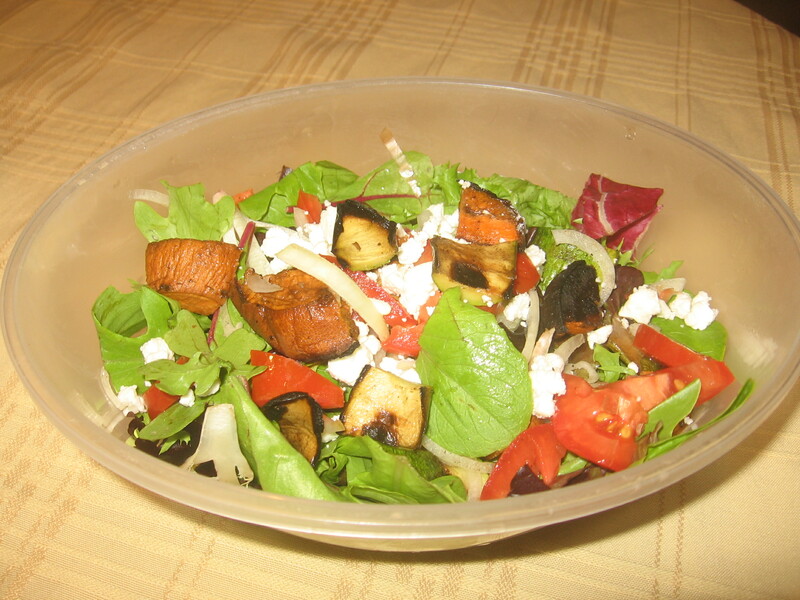 The salad you see here is using the leftover grilled veggies from the other night. It consists of spring mix, grilled zucchini, sweet potato, and baby peppers. On top of that is some onion, tomato, and feta. I sprinkled some Italian seasoning on it and dressed it with pear vinegar mixed with olive oil. It’s a perfect dinner for work or home. Completely unrelated, I just got a text from my son who is in Prague. He’s 2 weeks into his 9 week European adventure and is finally completely over his food poisoning and is feeling well. Apparently he is able to cook in the hostel where he’s staying. His text stated that he was in a store and needed a recipe asap. He’s with a girl who speaks enough English and can help him shop. I sent him my original Fettucini Alfredo recipe which I posted 12/22/09. It has very few ingredients and is easy to make anywhere. I can’t wait to hear his results!